"I found this recipe a while ago, but I changed it quite a bit, so here is my version. 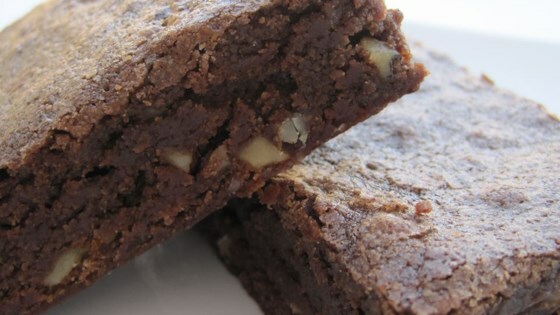 This type of brownie is not too sweet nor too dense. I would definitely say this is a mature brownie." Preheat oven to 350 degrees F (175 degrees C). Line a 12x15-inch baking pan with parchment paper, leaving about 3 inches of paper overhanging 2 sides to use as handles. Place the butter in a microwave-safe bowl, and cook on Medium until the butter is about half melted, about 1 minute. Mash the butter with sugar until well combined, and stir in eggs one at a time, incorporating each one before adding the next. Mix in vanilla extract. Sift the cocoa, flour, cinnamon, pequin pepper, salt, and baking powder into a bowl. Sprinkle in any salt caught in the sifter. Mix the flour mixture into the butter mixture, stirring to blend well, and pour the batter into the prepared baking pan. Bake in the preheated oven until a toothpick inserted into the center comes out with moist crumbs, 20 to 25 minutes. Let cool in the pan, and use parchment paper handles to remove the brownies for slicing. If you can't find ground pequin pepper, substitute ground cayenne pepper. They were O.K I've had much better brownies before. They just didn't taste like the best. I thought they were delicious just plain but especially good with ice cream on top. I had to make them closer to 35-40 minutes though. They were not nearly done at 20-25 as the recipe says.